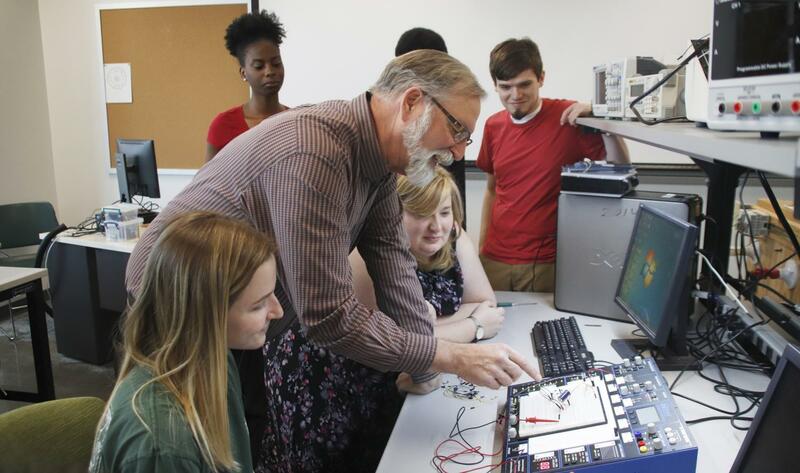 The Department of Industrial and Engineering Technology prepares students for industry through hands-on learning. The Department of Industrial and Engineering Technology offers students hands-on training, an industry-driven curriculum and the opportunity to earn two degrees offered nowhere else in the region. Dr. Priyadarshini Dasgupta, assistant professor of Occupational Safety, Health and Environment, described the department as unique because it focuses on field-based subjects. “We deal with the real world implementation of equipment, solutions, tools and risk mitigation technologies,” said Dasgupta. According to Dr. Mohammad Saadeh, head of the Department of Industrial and Engineering Technology, the curriculum is driven by interactions with industrial partners. Adapting to industry needs prompted the department to add a concentration in welding. Firms regularly contact the department seeking candidates to fill needed positions. The U.S. Bureau of Labor Statistics projects little or no change to the demand for industrial engineering technicians from 2016 to 2026. In the same period, overall growth for drafters is projected at seven percent, though this may fluctuate based on location and specialty. The median salary for students who graduated in December of 2018 was $52,000. Dasgupta explained how the department prepares its students for their jobs. Zachary Guy, a senior engineering technology major, likes the courses offered by the department. William Campbell, a senior OSHE major, believes the department’s hands-on training helped prepare him for a future in the industry. Candace Amos, a senior OSHE major, feels her professors have inspired her to work hard toward her goals.